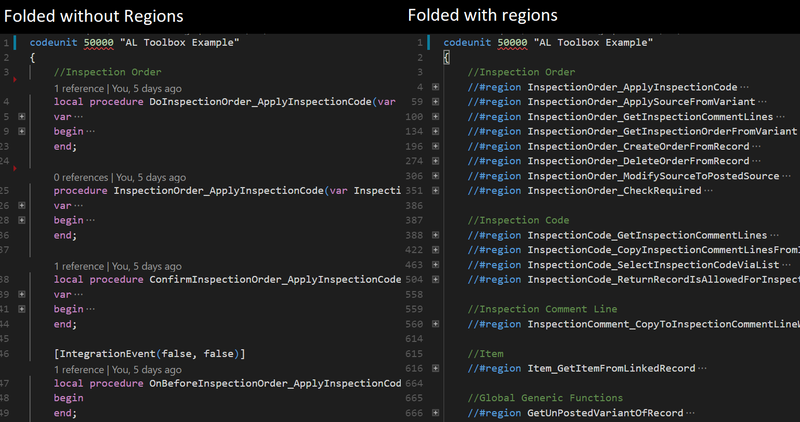 Visual Studio Code>Snippets>AL ToolboxNew to Visual Studio Code? Get it now. Please visit https://www.altoolbox.com/ for more in depth information and AL Language tips and tricks. The AL Toolbox extension adds the region functionality to the Microsoft AL language for Business Central. The extension also adds some usefull snippets with this region functionality and some Design Pattern Snippets. This extension has been inspired by the GitHub user RafaelKoch with his post https://github.com/Microsoft/AL/issues/1007 to implement regions into the AL language. I've been using the suggestion of anzwdev to manually add it to the al extension every month. I got tired of it so I created this extension to do it automatically. This extension contributes no settings yet.